First you have to soak the legumes. Therefor put them in a big bowl and cover with lots of cold water. Now cover the bowl and let the legumes soak for 24 hours. The longer you let them soak, the less bloating they will cause. After soaking, drain and wash them thoroughly. Now cook your beans and chickpeas firm to the bite. Add in some salt and bring it to a boil for a minute. 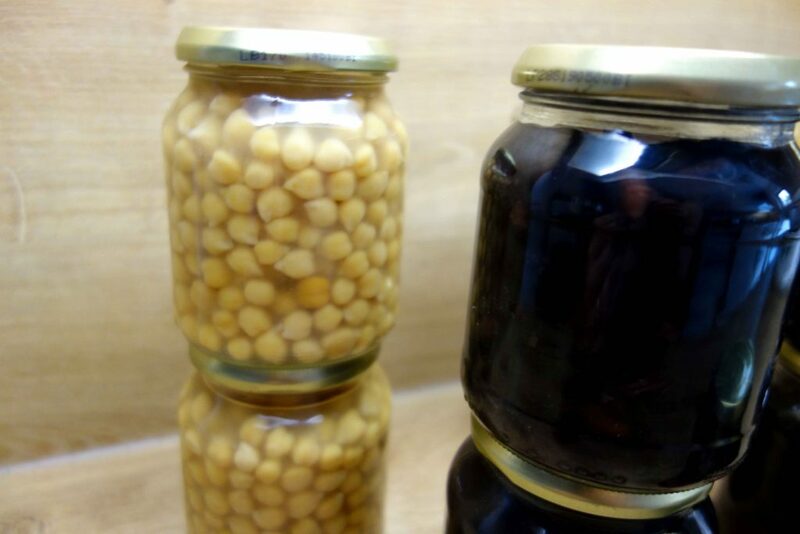 Now pour the legumes into sterile jars, cover them completely with the cooking liquid and close the jars with the lids. Then you add the rack and the filled jars to your automatic canning pot. Fill the pot with water until the jars are 3/4 covered with water. The temperature of the water must always be adjusted to the temperature of the jars. This means it has to be hot in this case. If you don’t have an automatic canning pot, just use a big pot with a lid. Lay a clean kitchen towel on the bottom of the pot, add the jars and fill it with hot water. The jars should never touch the bottom of the pot! Now you have to can the jars at 100°C for 30 minutes. Repeat the canning process two days later. Legumes have a lot of protein and this can help spores of some germs to grow. With canning the jars twice, you kill all of these spores. That way you can store your legumes in your pantry for a minimum of half a year. If there is any glass in your pantry having a lid that is curved upwards or that doesn’t make the typical sound when opening, please ditch it- even though it looks and smells normal. You can suffer from a severe food intoxication, if you eat it.